The Supreme Court has agreed to examine the question whether courts are statutorily empowered to make life imprisonments tougher for the convicts by adding 'rigorous'. NEW DELHI: Can the word 'rigorous' be added by courts when they award life imprisonment? The Supreme Court has agreed to examine whether courts are statutorily empowered to make life imprisonments tougher for the convicts by adding "rigorous" (harsh) to life sentences as the law does not provide for this. A Bench headed by Justice P C Ghose considered a submission which said that neither the penal provision dealing with the offence of murder, nor the Code of Criminal Procedure (CrPC) provide that the term "rigorous" can be added by courts while awarding life sentence to convicts. "Let a notice be issued in the matter limited to the question whether life imprisonment could be coupled with the condition that such imprisonment has to be rigorous imprisonment, returnable after four weeks," said the Bench, also comprising Justice U U Lalit. Senior advocate Parmanand Katara, appearing for convict Ram Kumar Sivare, who has been awarded rigorous life term in a murder case, has contended that the judgement pronounced by the courts was "unconstitutional and ultra-vires" as penal and procedural laws do not empower them to qualify a life sentence with the term "rigorous". "The award of rigorous life imprisonment by the lower court and the Chattisgarh High Court is violative of Article 21 (protection of life and liberty) and 14 (right to equality) of the Constitution," the lawyer said. The apex court was hearing the appeal filed by Sivare, who is serving RI at a Chattisgarh jail, challenging the High Court verdict in a murder case. 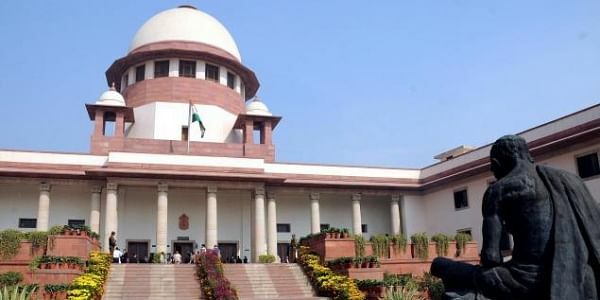 The High Court had upheld the trial court judgement convicting and awarding life term to Sivare and Bhuneshwar Prasad for stabbing to death an Anil Bhoyar on January 5, 2010 near a government hospital in Durg district of Chattisgarh following a tiff over a minor issue. The trial court had acquitted the third accused Manoj, which was upheld by the High Court.